At around 7:15am on Sunday 10th March, patients of Wincanton Community Hospital, and some residents living nearby, may have been woken with a start at the sound of a fully grown poplar tree crashing to the ground as a result of very strong winds. 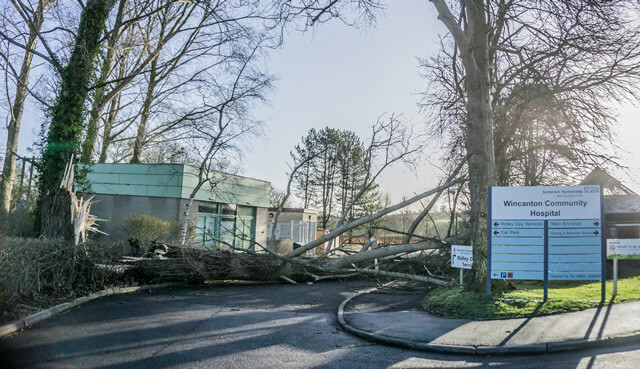 The tree, approximately 100 years old, standing on the immediate left of the entrance to the Hospital car park, snapped clean at around 6 or 7 feet from its base, and fell across the road, completely blocking it. The tree’s branches also fell against some of the hospital outbuildings, but miraculously they don’t seem to have been damaged. The falling tree also caused some collateral damage to trees on the opposite side of the drive, and pulled down a power line leaving the Hospital powerless, but thankfully power was restored after about an hour and a half. To make matters worse, much of Wincanton suffered another one-hour power outage at around 11am. This follows an earlier incident when a large limb fell from the same tree back in October 2018, but perhaps more coincidentally, only weeks ago, another large tree that stood on the opposite side of the Hospital entrance also fell in strong winds, that time blocking the staff car park entrance, and also causing very little damage. At first glance it might appear the Hospital is experiencing a strange brand of luck, but analysis of the nearby trees has revealed evidence of disease, so it's likely several others will be felled to prevent future damage. During the same bout of windy weather, a mature tree in the cemetery grounds of Wincanton Parish Church of St Peter & St Paul was also felled. Again, a clean break, this time about 20 feet above the base. The tree fell between two houses along Church Walk, the footpath that separates the residential development from the Church grounds, connecting Station Road and Churchfields. In this case there was some damage to one of the houses. Tiles were stripped from the roof and some window sills were knocked off. There was also some ground damage. Given the size of the tree, the damage could easily have been considerably more serious. The felled tree was one in a row of several trees of similar size, though different species. Analysis of this tree has revealed dry rot, raising concerns over the fate of the remaining trees in the row that runs parallel with the houses along Church Walk. 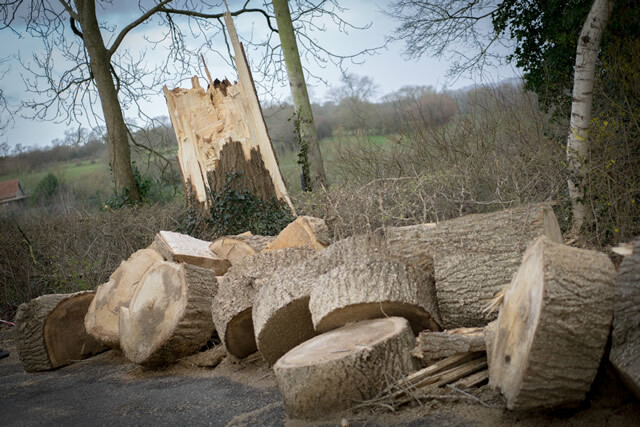 As a result, the Wincanton Town Council is investigating the possibility of pollarding the remaining trees to reduce the wind force they'll capture in future. 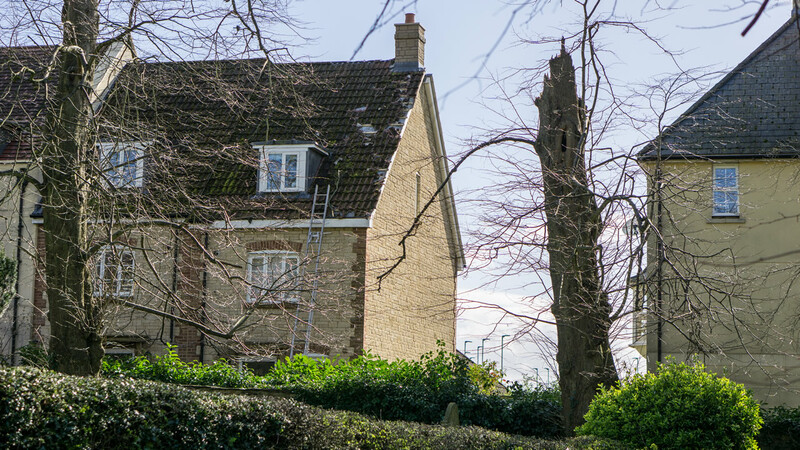 Local business Wincanton Tree Care was called into action and Jason Lazell and his team promptly removed the debris, allowing contractors to begin work repairing the roof damage.